CBeebies popular Mr Bloom is coming to town with his family of Veggies in a new stage show, Mr Bloom’s Nursery – Live, which will delight young audiences who want to meet their favourite veggies and join in their new adventure. The award-winning Mr Bloom’s Nursery evolved from an interactive street theatre piece called The Vegetable Nannies, created by actor Ben Faulks. In 2009 Faulks approached the BBC with his ideas and the show was developed into its current format, which is watched by thousands of pre-school aged children and their parents. Many mums have admitted that Mr Bloom is their guilty pleasure and Faulks is delighted that his show attracts a diverse audience. Ben Faulks was born in Cornwall, where his family still live. He trained at the famous Bretton Hall and then relocated to Manchester and, eager to create his own work, founded a street theatre company, Plunge Boom, which is still going strong. He was commissioned to produce three pieces of outdoor theatre and one of those was Vegetable Nannies. His inspiration was an old wooden Victorian pram that he found when he was out with his parents. He bought the pram, then purchased some vegetables and some baby accessories from Mothercare and hey presto, his Veggies were created. Originally a one-man show with the Veggies puppets, it later included another actor and Vegetable Nannies toured worldwide with great success. As Faulks explained, the Europeans are more accustomed to outdoor theatre and the show was also well received at an outdoor Arts Festival in Montreal. With three young children of his own, Faulks regularly watched CBeebies and realised his show would work well on Television, which lead to his successful pitch. A big part of the show’s success is down to the charismatic Ben Faulks. He has a wonderful rapport with the youngsters involved in the show, known affectionately as Tiddlers. The Veggies are adorable too and Ben explained that they are all youngsters of pre-school age with their own distinctive character. Margaret the Cabbage is sensitive with a zest for adventure and is fascinated by space, and especially the moon; Joan the Fennel is a fusspot who loves dressing up in a variety of costumes. She likes to be the centre of attention and is the self-appointed leader of the pack; Raymond the Butternut Squash may not be the brightest but he is very thoughtful and has a big heart; Sebastian the Aubergine is French and suave with a passion for the arts and loves to sing; The Wee MacGregors are the Radishes, a law unto themselves – cheeky, mischievous, observant and attentive – then there is my favourite, Colin the Runnerbean, the youngest of the pack, a typical little boy who loves adventure and is full of energy. The brilliant thing about Mr Bloom’s Nursery is that not only is it hugely entertaining but it is also educational – watching a recent episode I found out things about asparagus that I never knew. It is a fun way for children to learn about vegetables and where they come from and to learn about nurturing and caring for babies. Faulks admits he himself is not a keen gardener, although he loves the outdoors. I wondered if he had based the character on someone he knew but this was not the case. “He was always going to be a happy Northern gardener but I haven’t based him on anyone” says Faulks. 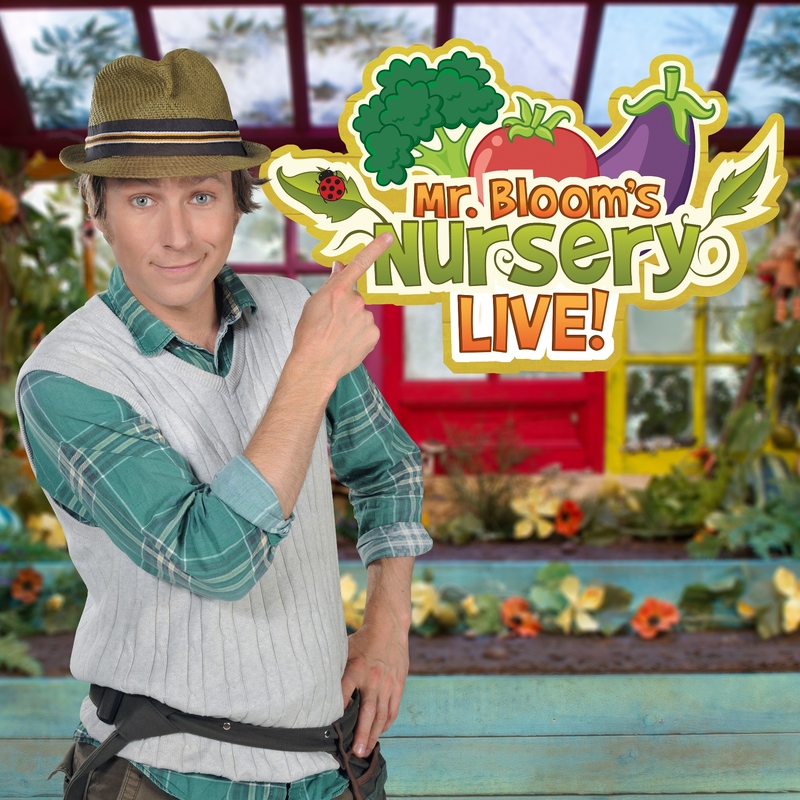 Mr Bloom’s Nursery – Live is the debut production of Munchkin Entertainment, a new production company focussing on high quality children’s entertainment, founded by Laura Taylor. Taylor is Associate Producer and Head of Marketing for First Family Entertainment and has a vast experience of the family market. As a young mum herself, she watched Mr Bloom’s Nursery on CBeebies and knew it would make a great live show. “I have known and worked with Ben for several years and I love Mr Bloom’s Nursery, as does my daughter, so it seemed the perfect recipe for our inaugural production” she explained. In this new show, Mr Bloom and the Veggies are awaiting the arrival of a very special guest. It will feature the Veggies, Compo the Compostarium machine and of course the Tiddlers will be involved with songs and games. 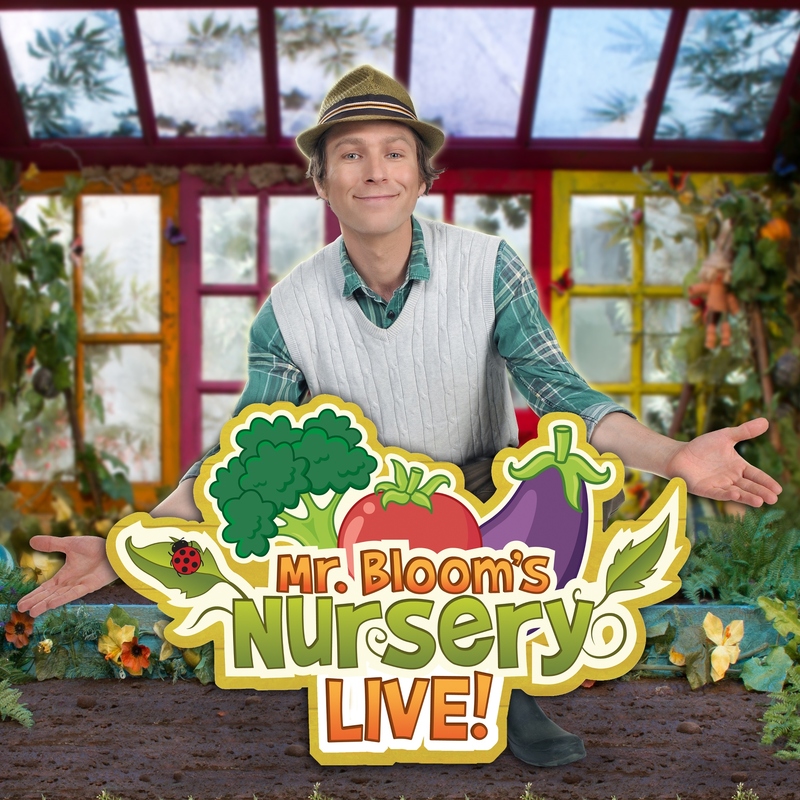 Mr Bloom’s Nursery – Live is currently touring the UK and without doubt this is one show that should not be missed, so come along and join Mr Bloom and his Veggies for lots of fun and adventure. It’s that time of year again when we all start making resolutions for the year ahead. Have you made any yourself for 2017? Do you think you’ll be able to keep them? Afraid not. Generally, I find that the deepest darkest months of the year are not the ideal time to stake claims for bold transformations. Better done in the Summer time. You’re an actor and as well as your alter-ego Mr Bloom you’ve in recent years starred in Panto and also had a role in Hollyoaks – how does that compare to working with children (and of course, the veggies?). For me personally, I love the variety of experiences acting provides. This is what I really thrive on. Each medium has its own challenges & that’s the bonus. If I can keep on finding roles that are different from the last, I couldn’t ask for more. The idea of Mr Bloom evolved from a street theatre production you created which you then pitched to the BBC (and they of course, loved). How successful did you think it would be as a television show? What do you think makes it so popular – even five years and five series’ on? You can never bank on people liking your work. You can certainly hope they do, but once it’s finished and out in the public domain, there’s nothing more you can do. For my part, I could see the concept, clear as day, working as a TV show. Thankfully, the BBC could too. As for the success it has enjoyed, that’s down to everyone else, not us. It terms of what makes it popular it’s impossible to say but obviously, it’s all a sum of its parts put together by a lot of hard graft & a lot of luck, being the right thing at the right time. You’re loved not only by the kids – it’s no secret you’re a big hit with the mums too. What do you make to all that? Some of your ‘admirers’ say some pretty fruity things! What do your friends and wife, Mimi make of the attention?! We have a giggle about it, as we’d no idea a tank top and wellies could be so attractive. But to be honest, given that I’m not on social media I don’t encounter a great deal of what goes on. You have three children of your own, how does life as Mr Bloom work around having a young family? What do they make of having a famous dad? They’ve grown up with me dressing up as different characters, so they’ve always got their head around it. Everyone’s Dad does something different. As for Mr Bloom, it was admittedly very special when they we’re younger and in the CBeebies age group, as it was of specific relevance to them. However, it is tough being away from home for extended periods of time, be it on tour or location but that’s the life we lead and it’s important to us as a family to make it work. When you’re not busy as Mr Bloom, what’s your favourite way to spend a day? Any gardening on the agenda? Favourite way to spend a day when not working? Everyone sits down together for a slow breakfast listening to Mary Anne Hobbs on BBC6 Music, then I nip out on my own for a quick run or cycle, come home, get cleaned up, make a packed lunch and go out with the family on some sort of local outdoor adventure, return home once again, set a fire, make pizza for everyone, then all sit down to watch ‘You’ve Been Framed’. Happy Days! Yes! Mighty exciting times ahead. It’s the first theatre tour we’ve undertaken. It’ll feature Mr Bloom & the Veggies. How will it differ from the television show? There will be familiar sights, sounds and activities from the TV show BUT this is a completely new story line & adventure. Also, the audience are imperative to the action, so unlike the TV show, they’ve going to need to get involved. Apart from all the familiar things the Mr Blooms Nursery offers, there’ll be the appearance of a VERY special guest.